It is made from 324 tiles in 10 colours, with a nominal size of 396mm wide x 396mm high (approx 16 x 16 inches). This mosaic design by an anonymous visitor is Copyright © 2016 Kaamar Ltd. 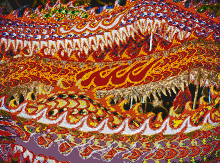 The original of this image shows the mosaic design at approx. 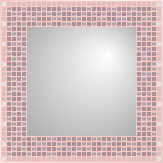 1 pixel to 3 mm, including grout lines and tile colour blocks (see the colour note below) but has been adjusted in size by your browser to fit on the page, blurring the detail. No of Tiles: 324 tiles (18 wide x 18 high) in 10 colours. Tiles: vitreous glass tiles, each 20mm x 20mm x 3-4mm deep. Mosaic Size: 396mm x 396mm nominal (approx 16 x 16 inches). Mosaic Area: 0.157 square metres nominal. Sheet Size: 326.6mm x 326.6mm (225 tiles/sheet) nominal. No of Sheets: 1 full sheets, 3 partial sheets.